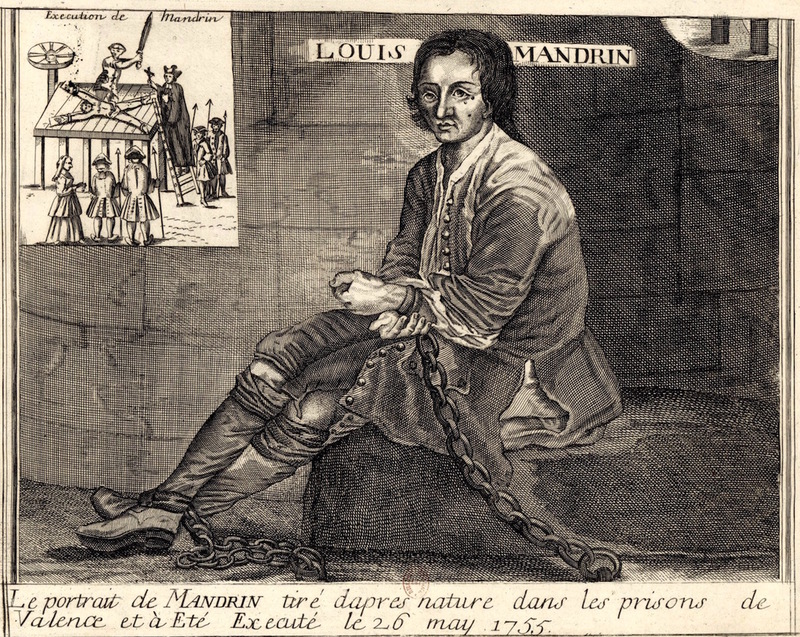 On this date in 1755, the French outlaw Louis Mandrin was broken on the wheel. 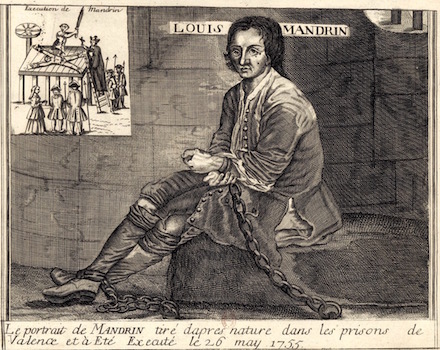 In common with the whole French populace, Mandrin had a beef with the Ferme general — the country’s tax-farming concern — but Mandrin was the one who did something about it. Specifically, he built a vast smuggling network in the 1750s that all along a vast north-south corridor from Burgundy to Savoy moved tobacco, cotton, and everything else the farm wanted to harvest — scoring political points along the way by thrashing the tax collectors whenever possible. 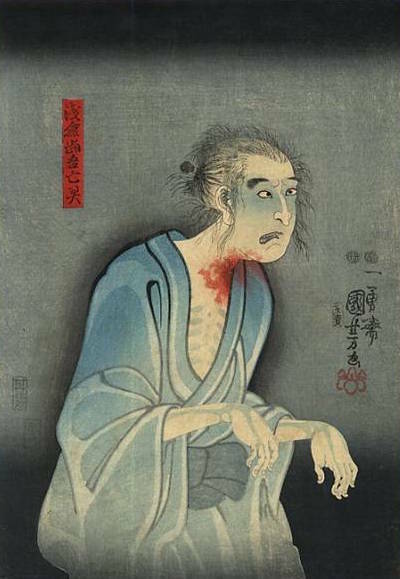 It’s said that he took pains to have his merry contrabanders stay out of the violence business, unless they had the opportunity to direct it at the revenue men. 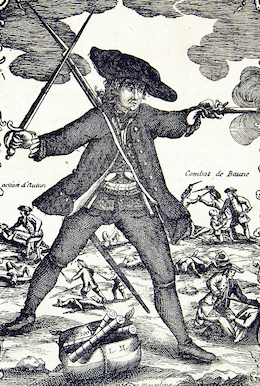 In the end, the Farmers General — a wealthy consortium that would one day soon commission a chunk of Paris’s city walls — provoked an international incident by illegally raiding Savoy to capture him, then having him tried and executed with speed to forestall any possibility of his return being negotiated. 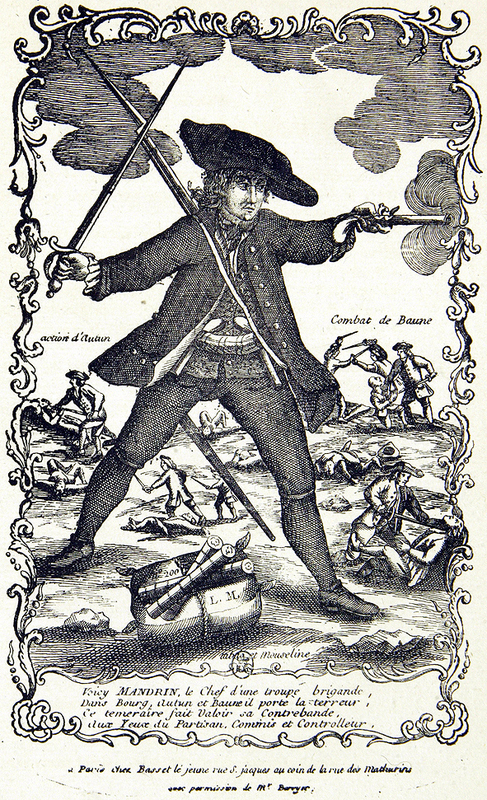 But the popular bandit entered the popular culture where he has long outlived the rapacious Farmers; he’s been the subject of multiple film treatments, most recently in 2011, and the pensive folk song “La complainte de Mandrin” still today maintains its currency.